February is soon approaching and even though it is typically the month retailers have us all thinking about love and sending valentines, the cold weather and our cooped-up kids don’t always make us feel very loving about our homeschooling or our parenting pursuits. Instead of giving into those winter blues, take some time during these next few weeks to put aside your regular lessons and try to refocus on the love of learning. And, what better way to do that than with these fun Valentine-themed learning activities? Here are my top 20 free picks from the SPED Homeschool Valentine Pinterest board. Still not enough choices? 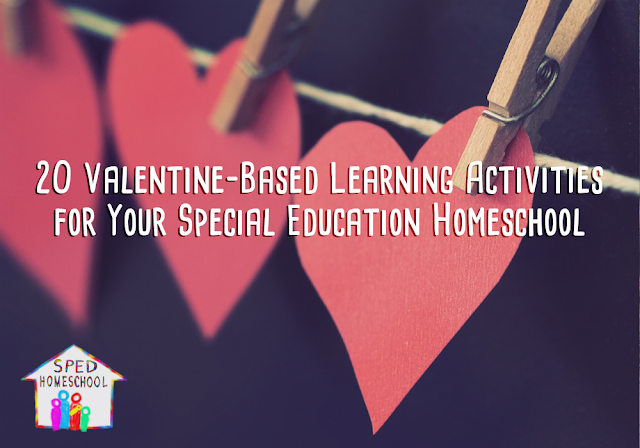 Then make sure to check out the SPED Homeschool Valentine Pinterest board containing over 200 more ideas to choose from. And, while you are there, make sure to check out the rest of the SPED Homeschool Pinterest boards.